Competitive advantage in today’s rapidly evolving e-business world is increasingly dependent on customer service as the key differentiator — regardless of how customers contact your organization. People are the most important component in the success of a business or contact center. 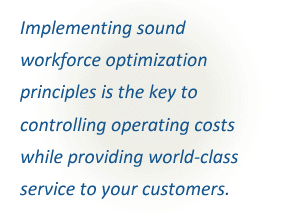 For example, with almost 80% of typical contact center operating budgets allocated to personnel costs, it’s critical to maximize the day-to-day performance of the contact center staff and support personnel by hiring the right people, and providing the best training, tools, supervision, recognition and career development opportunities. Based on the findings from that work, we address a variety of people-related issues and facilitate a continuous stream of process improvements consistent with evolving customer needs and expectations. Typically these result in improved employee morale, higher quality and productivity, and reduced costs — all of which are reflected in bottom-line performance.